This was the program for Susan’s Memorial. (The picture on it was taken about five years ago.) I was so honored to participate! 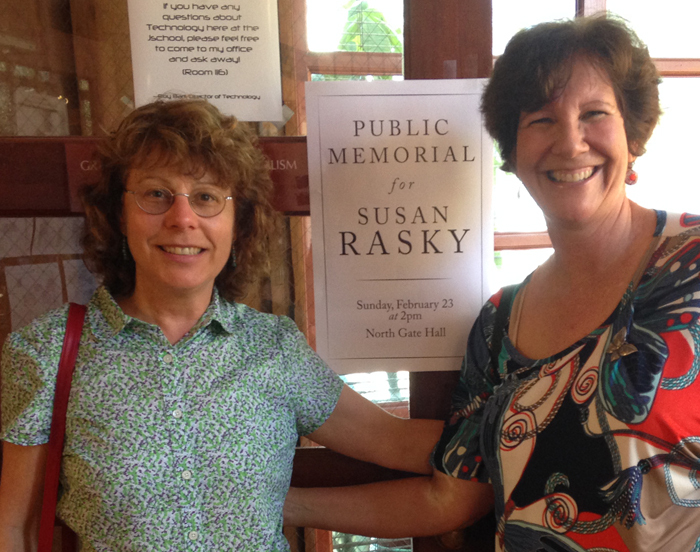 I plan to write many more stories about my inspiring few days honoring my good friend, Susan Rasky. This past week, I attended a memorial for her at UC Berkeley where she was a journalism professor. It was electric to be in the same room with so many amazing and accomplished people. And Susan had influenced everyone there in profound ways. Susan mentored and helped many of her students achieve great success in their careers. Even though she never married or had children, she was a consummate mother to so many people. And I found out that she was even a matchmaker! In addition to helping me survive my ordeals as a caregiver, It was Susan’s encouragement about my creative endeavors that meant so much to me. I am not a journalist and love how I get to write stories from my heart. I begin writing about her memorial with the part that easily causes my tears to flow. I am zeroing in upon grief as I often do. But this one surprised me because I am not a pet owner. My sadness was for Lucy, Susan’s poodle. 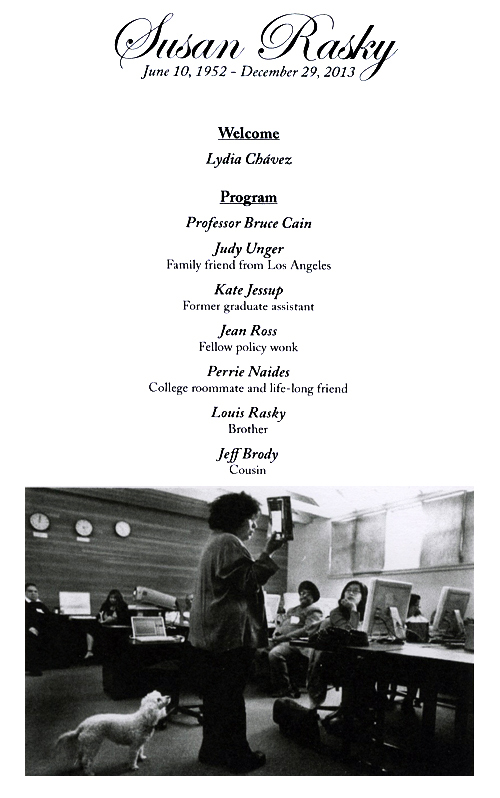 The program for Susan’s memorial showed Lucy behind her while she was lecturing. It was humorous and an interesting choice of picture for Susan. It definitely had me chuckling. 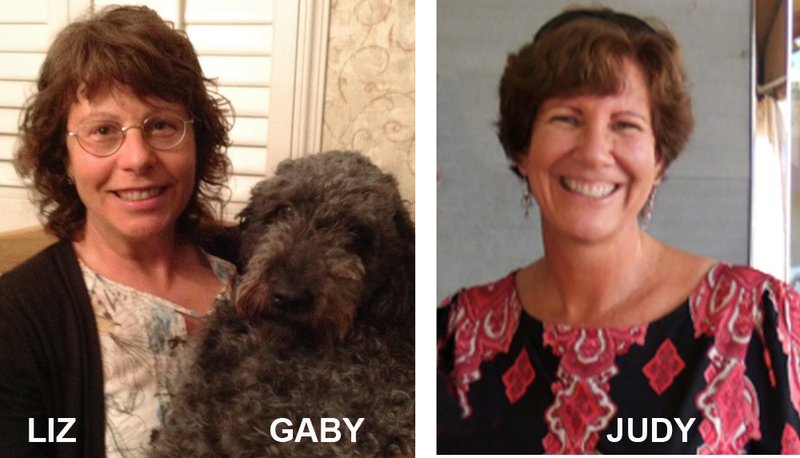 A year later, Susan brought Lucy with her on another visit. She came with her mother to visit my mother at her nursing home. Susan was relieved that pets were allowed and even encouraged there. 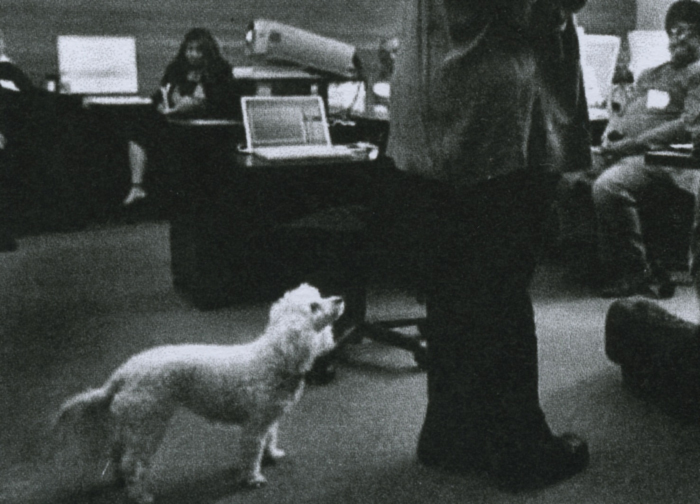 As I looked at the picture on the memorial program, I suddenly understood why it was chosen – I could actually imagine Susan bursting into the lecture hall with Lucy behind her. My ears perked up when I heard that Lucy would not come out from under Susan’s bed for weeks after her beloved owner had died. And when I saw Susan’s 96-year-old mother for lunch on the last day of my trip, her mother’s eyes watered when she insisted that the dog shed actual tears when Susan was taken to the hospital while she was dying. A few days later, Susan was discharged and her brother was overwhelmed trying to deal with physically transporting her home. Hospice did not arrive in time when Susan was close to death. 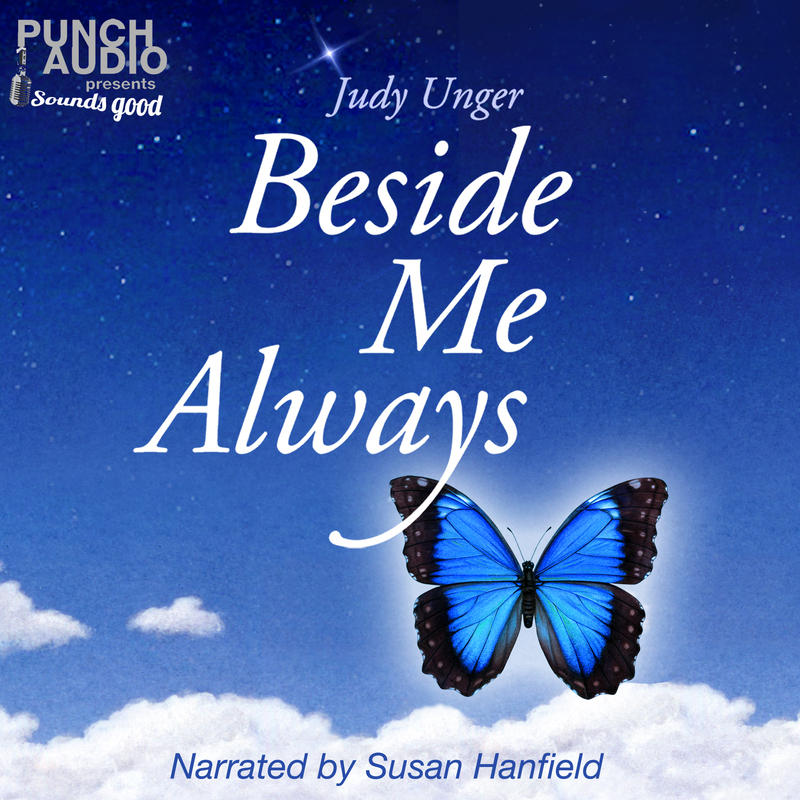 Thankfully, an experienced caregiver for Susan’s mother was there to help. I found Susan’s brother to be an amazing man. He not only took care of their elderly mother, but he dealt with his sister’s agony as she declined and then died. Susan’s mother told me that after her daughter died, Lucy clung to Susan’s body as long as she could. It has been several months now, and Lucy still goes under Susan’s bed for much of the day. Travelling with my dry eyes was not something I looked forward to. But attending Susan memorial was very important to me. I especially looked forward to meeting other people who had been touched by Susan; I wanted to learn more about my amazing friend. I also wanted to find out the circumstances of her illness and death, which she chose to carry privately. There was also more to my trip than just Susan’s memorial. I was going to be spending two nights with a woman I had never met – or if I had, it was so long ago that I forgot because I was a young child. Her name was Liz. Her mother, Sophia, and Susan’s mother, Evelyn, were all close to my mother. This trio of woman had shared so much of their lives together. And with old age, all three of them had great difficulty maintaining contact due to dementia and physical distance. Liz was very helpful as I made my airline arrangements. The flight was a little over an hour and Liz planned to pick me up at the airport. She sent me a picture of herself and I did the same. We were several hours early to the event because my plane had landed early in the morning. Liz found a parking space on a hill nearby where the memorial would be. We both decided to check out the building and then have some lunch before the event, which was scheduled for 2:00 p.m. I could feel so much history in the old building we entered. It was quiet because it was Sunday; I closed my eyes and imagined the hallways filled with noisy students. The odor of wood and nostalgia tickled my senses. This was where Susan devoted so much of her life. Oh, how I wished that Susan was with me proudly showing me around! In a quiet moment, I examined a flier for the memorial on the wall. 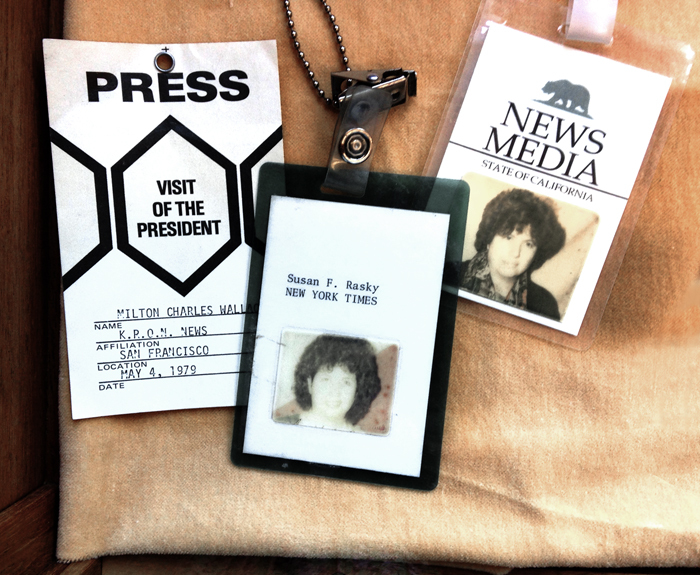 Liz pointed out Susan’s former reporter badges that were inside a nearby display case. Susan had been a top-notch reporter for the New York Times. I only recently remembered that when I was 20 years old, I visited her where she worked in Washington DC before I was married. Susan set my friend and I up with wonderful tours of the Capital and I wished I had taken a picture with my big sister back then. Now I realize how blessed I was to know such an incredible woman. But sadly, I wish I had appreciated her more while she was still alive. Of course, I was carrying my guitar so she must have easily figured that out! Lydia smiled. Liz and I began to ask her many questions about Susan and whether anyone else was as unaware as we were about her cancer. It turned out that as sick as she was, Susan kept working up until the end. She did take the fall semester off, but was determined to come back to work in the spring. She died during the holiday season and so many people at the memorial mentioned how shocked they were that she wouldn’t be coming back. I was honored that we were allowed to see Susan’s office. My waves of sadness continued because I wished it were Susan unlocking the door for me, instead of Lydia. So many times Susan had encouraged me to come and visit her – even when her apartment was cramped while her mother and brother lived with her. I thought that this year I would finally take her up on that offer, but now it was too late for that. I felt tears filling my eyes as I looked at the boxes stacked up to the ceiling. I wondered where they would go. 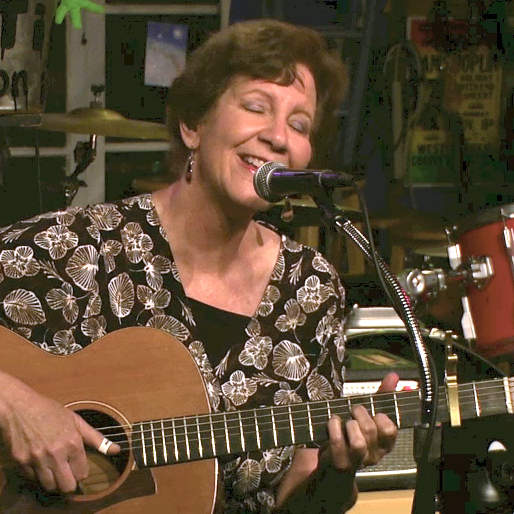 Susan was such a passionate, caring and devoted teacher. Inside those boxes were the story of her life. Before Liz and I left to walk around and have lunch, Lydia took our picture. I might be smiling on the outside, but inside I was crying. This entry was posted in Uncategorized and tagged acceptance of loss, Aging Parents, blogger, blogging, breast cancer, burden of caregiving, Caregiving, caregiving responsibilities, childhood friendship, coping with grief, death, death of a close friend, death of a friend, dementia, dog's grief over loss, friend's support, Friendship, friendship and loss, grief, grief of a dog, grief of a pet, GRIEF RELATED, I'm Taking Off, inspiration, loss, loss of a good friend, siblings and caregiving, Susan Rasky, Susan Rasky's memorial at UC Berkeley, therapeutic writing, writing. Bookmark the permalink. She and I hardly met. She read my messages and always had wise things to say that helped me. Gee, that sounds like you! I have been thinking about you a lot with your blisters. I feel with my dry eyes, it’s another one of those caregiver conditions that plague us when we stuff our feelings. I’m working on trying to figure this one out and hope I’ll get through it soon. Started watching my eating this week – that might help me. Thanks, Julie. You are also an amazing friend! I think you are right re the health conditions – my hands are healing very slowly and I was able to go in and see Ants today, but your condition is so much worse and so frightening for you. I am full of hope for you though!